Home / School of Clinical Medicine / Department of Psychiatry / Students / Congratulations to Michael Hart for submitting his PhD! Congratulations to Michael Hart for submitting his PhD! We would like to congratulate Michael Hart on successfully completing his PhD! Michael completed his PhD under the supervision of Dr John Suckling. Here Michael gives us a quick summary of his work and findings. Essentially I map out social networks but in the brain. Here we view different parts of the brain as like people and then study the interactions between these people (for example, how information is exchanged or rumours spread). We can do this quickly and affordably now with MRI scans. My role is in the data analysis that is essentially computational (i.e. dry lab), which suits me perfectly. I love the coding, challenge of learning new analytical techniques, and the beautiful visualisations that are often final output. With these data we try to predict how brains respond to injury and how it can recover (i.e. its plasticity). My PhD was looking at how these brain networks form over adolescence, and particularly whether there were any changes that we call ‘plasticity’ which could be harnessed to encourage repair following injury. I found that the brain organises itself in a manner that enables it to become more robust to local injury, but without increasing its vulnerability to more global diseases; previously it was believed that the brain had to balance global versus local protection. This was also in contradiction to the belief that younger brains were more robust to injury. Additionally, I translated network research to patients with brain tumours, and published the first paper describing the principles and validation of this approach. This allowed the field to move on from considering brain tumours as just a local disease, but rather to consider effects on the whole brain. 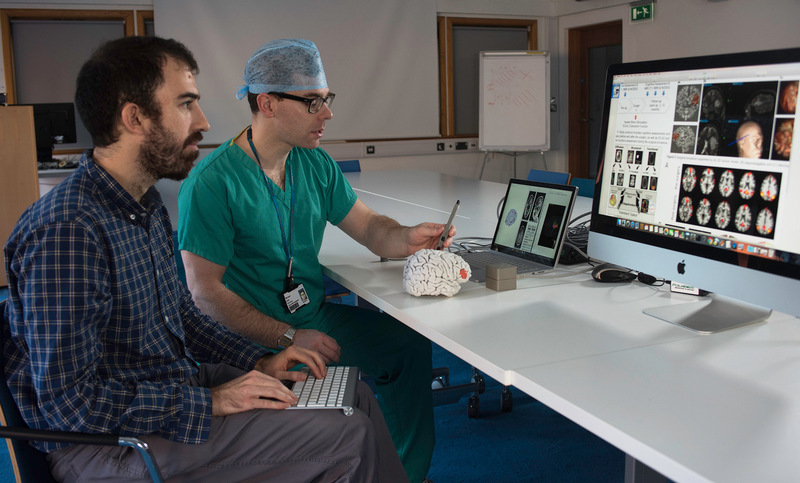 It also enabled the neurosurgeons to study novel surgical approaches to removing tumours and understand higher cognitive outcomes of patients. I was always interested in how the brain worked and fascinated by it’s complexity. This was one of the main reasons I got into neurosurgery, so it was natural evolution to explore this in more detail as part of a dedicated research period. In terms of how to explore the brain, I had always been drawn to neuroimaging for its combination of physics, computational analysis, and visualisation. However one of my main goals was to learn the general principles of best research practice (i.e. ‘what is a good research question?’), and develop a core of valuable research skills (e.g. coding, statistics, advanced analytical techniques such as machine learning). Fortunately in Cambridge there was an abundance of opportunities to explore these areas in as much depth as I could have ever possibly wished. When I found out that my follow-up trial CAESAR was funded. Even though this was due to commence after my PhD, it was based on work I had done during my thesis, and the fact others were willing to commit funding based on this served as a great validation of the work. Also any day a paper was accepted was also a cause for celebration. And when an analysis worked out or there were interesting findings was exciting. Finally, while I was not expecting the final handing in of the bound copy of my thesis to be anything other than an administrative exercise, it actually felt rather profound as it summed up the past 3 years, and all the hard work and experiences involved in the journey. Having a paper rejected on my birthday – there is no justice! However, I was fortunate in that my supervisor was always supportive and never put me under this pressure. It is also inspiring to see the field as a whole move on from this ‘publication or perish’ culture and concentrate more on other markers of research contributions. I am currently leading a trial called Connectomics And Electrical Stimulation for Augmenting Resection (CAESAR). This is looking at applying our brain network research to neurosurgery in order to make removing brain tumours safer and more effective. This also has the goal of translating network science to the operating theatre, which require a core technological development theme. So far we have already had success through collaborations with industrial partners, 3D printing, and creation of a surgical planning interface. We are working in Cambridge for the next years and have a great team of Rafael Romero-Garcia (Guarantors of Brain Fellow) and Ajan Mandal (Gates Scholar), as well as being able to continue to work with my PhD supervisor John Suckling.